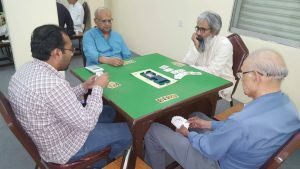 The KBA Management in order to promote bridge especially among the young Pakistanis has organized holding of weekly events in venues which include Karachi Gymkhana, Karachi Club, Defence Club or Golf Club or at Aslam Hall. 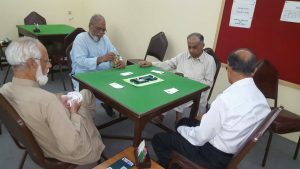 Besides the weekly events, annually there are two major Pairs & Teams events each at Karachi Club and Karachi Gymkhana. In addition, KBA also conducts a couple of preliminary Open Trials for selecting a team for international participation and Finals of All Pakistan National Trials under Pakistan Bridge Federation. 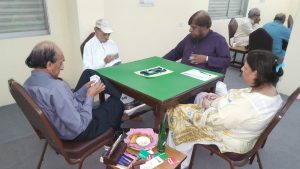 Allsportpk as part of its policy to support any activity which helps to develop mental discipline will be providing regular coverage to all such events. 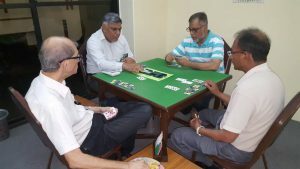 If any who desire to learn bridge are encouraged to contact KBA Management Team for lessons and training sessions via email address: newkba@gmail.com. 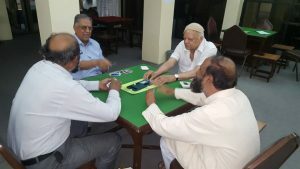 The KBA Sunday Bridge held at the Aslam Bridge Hall comprised of 2 Session Pairs instead of the Regular Team Event for lack of proper quorum wherein as many as 10 pairs contested. Coming runners up in the first session and topping in the second the indomitable veteran pair of The highly experienced Ghaffar Qureshi and the cool and consistent Naseem Arzoo was the winner of the 2 Session Pairs aggregating 61.27%, closely followed by the very talented pair of Ghulam Muhammad and Saleem Zaki who had won the first session with a mammoth percentage of 69.30 but had to be contented with the Runners up Position in the combined result due to a low average plus score of only 52.5% in the second session. 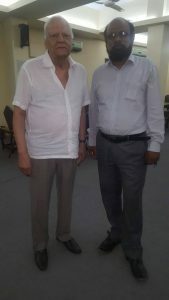 The regular Partnership of A.K. Bhurgri and M. Zubair played with consistency to occupy the overall third position with a 58.47% score having secured the third position in the first session and the runners up position in the Second. The next Bridge Pairs Event is scheduled for Tuesday the 25th April at 06:00 pm in the Karachi Golf Club. Next articleYounis Khan: Pakistan’s first batsman to score 10,000 runs in Test cricket.